Excuse me—Xander Grant. That’s right—the mega-hot entrepreneur who seems to top every magazine’s “Rich Eligible Bachelors” list these days. To me, he’ll always be Alex—my childhood best friend. The guy who joined me on all sorts of wild teenage misadventures. The only person in our small town who understood me. We’ve both changed so much—I mean, the guy used to live in ripped jeans, and now he wears nothing but designer suits—but when I need it most, he offers me exactly the escape I need. A chance to run away from my life, if only for a few days. 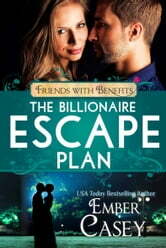 I am a huge fan of Ember’s and have loved all of her books that I’ve read to date. Her writing style is superb and she really gets a person invested in the characters. This book is no different. From the beginning, Ember introduces you to the main characters and you immediately feel a connection to them. I have an affinity for books that make me feel something and this book did just that. There were times I laughed at the witty dialogue, cringed at the awkward parts, cried during the emotional scenes, and was enamored with the charming love story. I simply could not put down this book and finished it in one day. I am a stay-at-home mom of a 4-year-old, so this says a lot. ;) I thoroughly enjoyed this book and would definitely recommend it to a friend. Worth every minute of time it takes to read!! Xander and Mae have been friends since they were kids. When Alexander aka Xander finally comes home. He's just in time to catch Mae as she falls apart. What are friends for? This book pulls at your heart strings who hasn't been cheated on? Then you add in that your rooting for Xander and Mae to form some type of relationship other than just friends. Definitely worth the money and the time to read!! Another winner from Ember Casey! A cute story about life long friends, that fell in love with each other years ago. Mae wonders why she isn't heart broken. Alex is happy she is free. Best friends sometimes mean more then friendship. Try this book it is a quick great read.